After what is now three decades of carp fishing, my attention towards other species has been .. well nil. 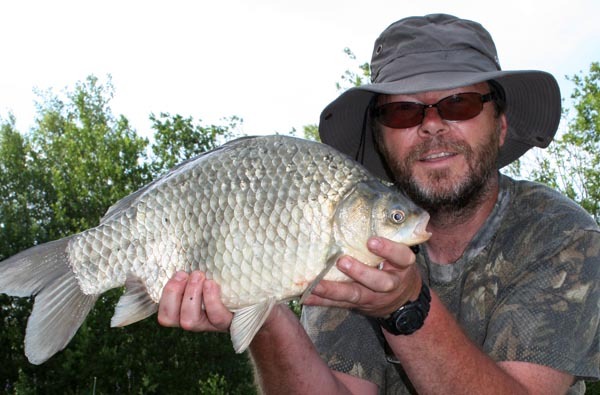 Carp have occupied the whole of my fishing time since I caught the first one as a boy while targeting tench. Recently on the video shoot for catfish I decided to pass some of the time between filming float fishing for some of the huge coarse fish that the Croix Blanche Lakes hold. I settled in to peg 15 armed with my trusty antique Bruce and Walker 13ft XLS glass float rod, some scalded carp pellet and three tins of sweet corn. Ron Woodward who was fishing for the cats for our film had told me that he’d seen lots of bubblers in the swim so I was confident that I might catch a couple. Well the float bobbed and dipped as it was attacked by hoards of small rudd on the surface, before gliding away. I struck into a powerhouse of a fish that I took to be a tench at first. As it came to the net I could see it was one of the lake’s big crucian carp. It only just fitted into my newly acquired pan landing net. And what a fish it was tipping the scales at over 6lb. I carried the net round to Ron and Jeff proud of my new PB crucian. Both were suitably impressed but doubted it could weigh over six pounds. So I zeroed up Ron’s sling and grabbed his Reubens to check the weight more exactly. 6lb 12oz was the weight the scales gave. Filled with enthusiasm I returned to my swim and re-baited my rod and cast back out. Not long afterwards, following a couple of rudd to about 1lb 8oz I finally got a tench. This too turned out to be a pb at 7lb 8oz. Again I wandered round to my friend’s peg to show off my prize. I finished the morning with 7 tench not one under 5lb and most over 6, with two over 7lb and four crucian carp all over 5lb 8oz and two over 6lb. Now in any specimen hunter’s books the catch was outstanding. I was utterly amazed that I could fish a few short hours I could catch such a quality stamp of fish. Oh and I nearly forgot, I had a pb rudd too at 3lb. While the carp were proving difficult to tempt on boilies I actually hooked three on float fished corn but on my glass float rod, 6lb line & size 14 barbless the battles were very one sided and resulted in three lost fish. I think next time I might step up my gear to say an Avon type rod and 8lb line to give a better shot and landing a carp. However I was amazed how enjoyable it was to play these large coarse fish on a 35 year old glass rod. I think that even if the blanks have improved beyond meassure these days, Bruce & Walker made quality kit back in the 70’s. If you enjoy a spot of float fishing even while you are carping, don’t forget your float geazr when you come to the venue. 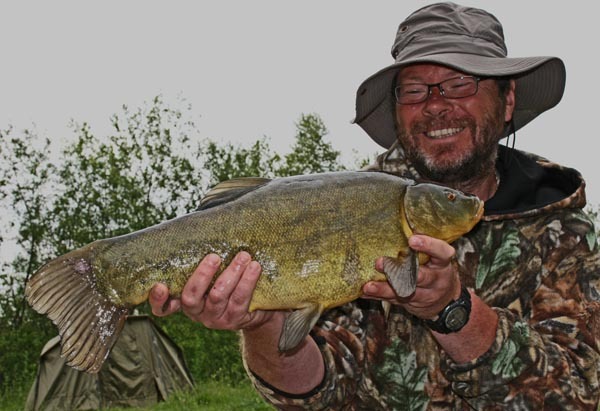 This entry was posted in News and tagged angling, carp, coarse, fish, flaot fishing, france, french, tench. Bookmark the permalink. However I may switch my tench bashing attentions to the Croix Blanche lake as it has produced tench of 12lb & 10lb in recent weeks.